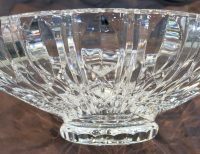 Epergne Replacement large round glass bowl. 11.6" Diameter x 4" high. The foot has a maximum diameter of 4.25". Please check your measurements before purchasing. If measurements are tight, please email me to confirm. Bowl weighs 2,715 grams. Most if not all items are antique or used items, and as such nothing is 'perfect', but we always will describe any damage, repair, inscriptions, monograms etc to the best of our ability. Please ask any questions BEFORE purchasing any item. All weights & measurements are approximate, but as accurate as possible. Please view all the pictures as they form part of the description. All items are available to inspect, and pick up, at our Manhattan gallery. We do not ship to PO Boxes. We use Fedex Ground shipping, and a signature is required for delivery. Don't forget we offer free ground shipping anywhere on mainland USA.